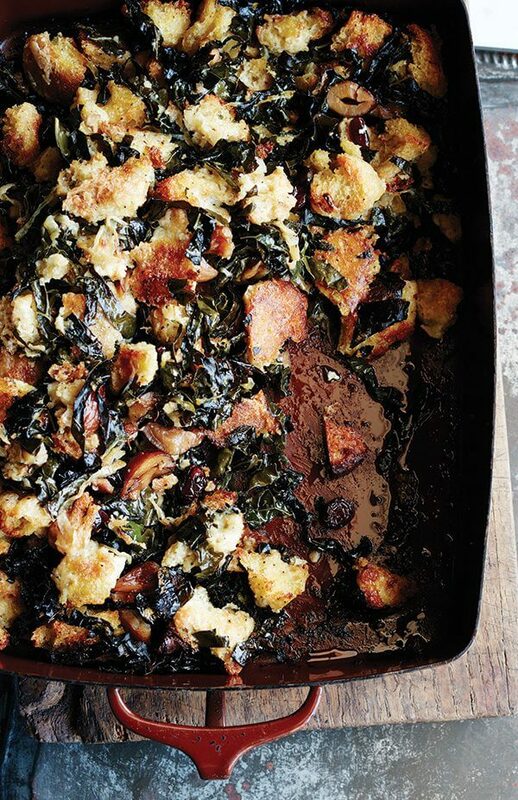 I’ve been trying to do a test run of Suzanne Goin’s stuffing with slow-cooked kale, but I can’t get beyond the cooking of the slow-cooked kale step. I’ve tried twice, but the kale keeps disappearing, and as a result, my loaves of country bread and bulbs of fennel continue to be neglected. Cooking kale in this manner is new for me. For one, like many people, I have taken to eating it raw not only because it tastes good but also because one raw bunch can be stretched over more meals than one cooked bunch. Second, if I do sauté it, I do it very quickly over high heat with a little olive oil, garlic and crushed red pepper flakes. I’m not sure I’ll ever do that again. 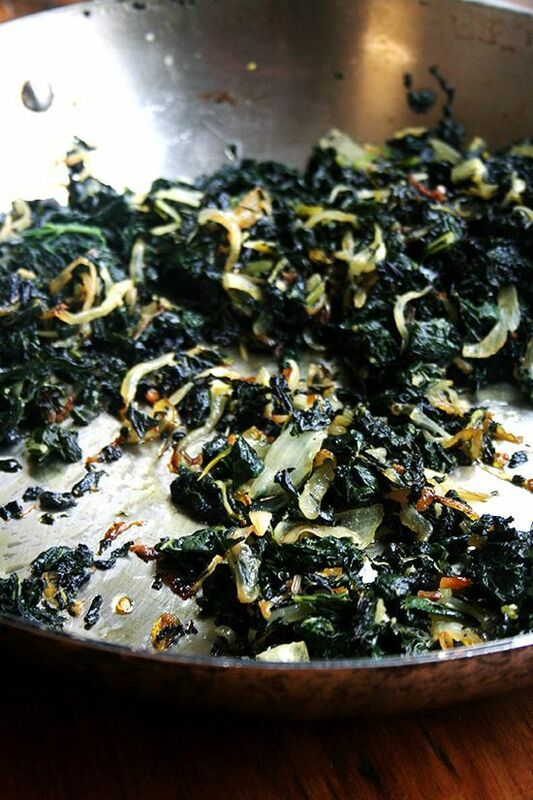 In Goin’s method, the kale is blanched first, roughly chopped and then sautéed over low heat for thirty minutes in olive oil with onions, garlic, rosemary and chile de árbol. It’s almost black and slightly crispy when finished. It is sweet and addictive. It’s dishes such as this that make me understand (almost) how people can be vegetarian. I ate the first batch in one sitting — yes, nearly one pound of kale — directly from the pan spooning bites here and there onto toasted bread only wishing I had the motivation to poach an egg. With the second batch, I did the same but saved enough to cover the surface of a giant omelet sprinkled with feta, which Ben and I devoured for dinner. Time’s a ticking, and I’m not sure the stuffing will make an appearance this year, but I’ll be sure to report back if it does. I hope all of your Thanksgiving preparations are going well. I’ve made my to-do list and with any luck red wine cranberry sauce and apple sauce will materialize; a corn syrup-less pecan pie will be baked (though I’ve struck out twice now); and a steamed-roasted turkey — cannot wait to try this — will be as juicy as promised. This is the batch I made with curly kale as opposed to Tuscan. It was still delicious, but as I noted above, I over crowded the pan a little bit, which prevented the pieces from getting as dark and crispy and delicious. This issue of course could have been rectified had I removed some of the kale and let the remainder crisp up on its own. 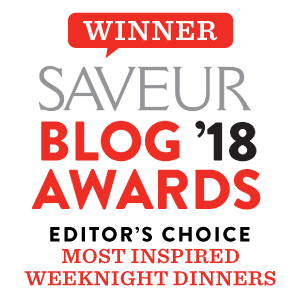 Source: Bon Appetit Bon Appetit’s notes: Tuscan kale, also called black kale, dinosaur kale, Lacinato kale, or cavolo nero, has long, narrow, dark green bumpy leaves; find it at farmers’ markets and some supermarkets. Dried chiles de árbol are available at Latin markets, specialty foods stores, and some supermarkets. My notes: I made one batch with Tuscan kale and another with curly kale. They were both delicious but the Tuscan kale was more so. The second time, too, I overcrowded the pan with kale and the pieces didn’t get as dark and delicious, so I would caution against trying to cram more than a generous layer of kale into whatever pan you are using. It does cook down a little bit, but not as dramatically as unblanched spinach or chard when sautéed. This kale is delicious on its own, but also makes a wonderful filling for omelets. I made a giant omelet in a 12-inch skillet using 6 eggs. After the eggs were mostly set, I covered them with the kale and then sprinkled some feta over top, which was delicious, but any number of cheeses would work well. I finished it off in a 350ºF oven for about five minutes or less — just until the uncooked egg was set. The stuffing, by the way, is delicious, too. I make a much simplified version, omitting the fennel and the fennel seeds. Heat a large pot over medium heat for 2 minutes. 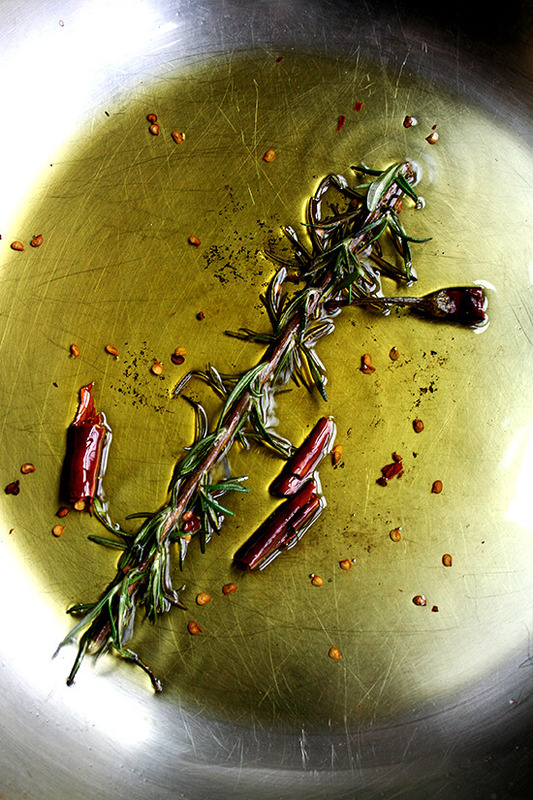 Add 1/4 cup oil, rosemary sprig, and chile. Let sizzle, shaking pan often, for about 1 minute. Reduce heat to medium-low; add onion. Season with 1/2 teaspoon salt and a pinch of pepper. Cook for 2 minutes, stirring often; stir in garlic. 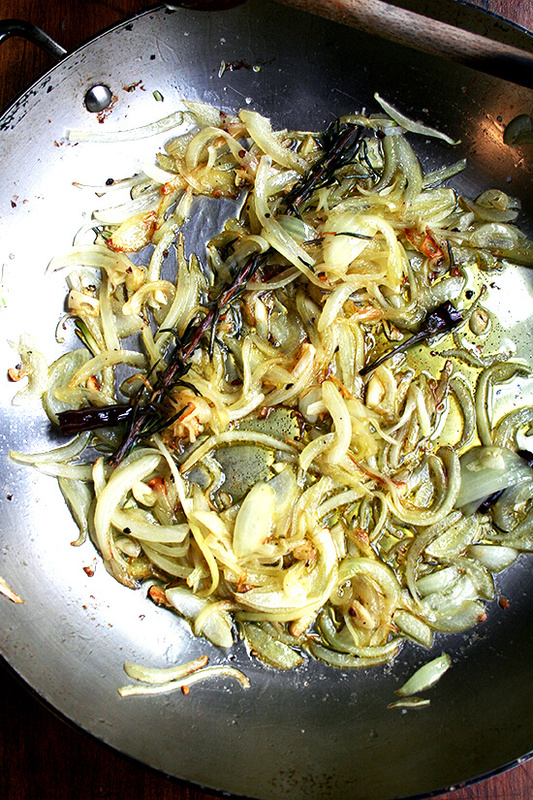 Cook, stirring often, until onion is soft and starting to brown, 5-7 minutes. Add remaining 2 tablespoons oil and kale; stir to coat. 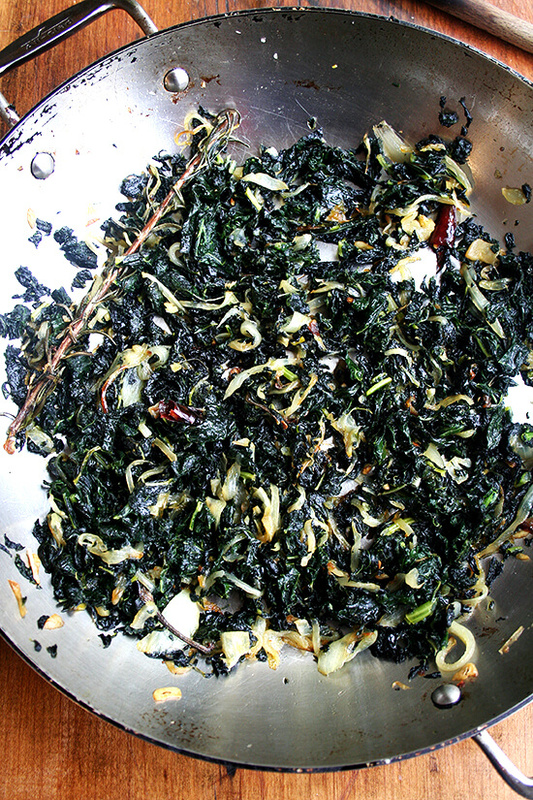 Season with 1/4 teaspoon salt, reduce heat to medium-low, and cook, stirring often, until kale turns almost black and is slightly crisp at edges, about 30 minutes. Let cool. Discard rosemary and chile. Sounds addictive but I am not sure if I’ve got it in me to spend 30 minutes cooking kale! 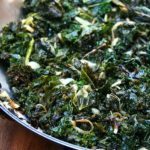 I usually cook my kale with garlic and handful of raisins – the plump up and it’s nice having those little burst of sweetness. Explody Full — I know, I know, but try, just once before you forget about it. I promise, it is so so good. I have never cooked kale with raisins, but I have a recipe for a sautéed spinach that calls for raisins and pine nuts and shallots, and I love it, so I imagine it is just as delicious with kale, too. I just downloaded my Thanksgiving (November) issue of Bon Appetit today (along with Sep, Oct & December – I had forgotten I had the ipad subscription) and I saw this recipe and immediately marked it. There is ONE stand at the farmers market that sometimes has kale, sometimes. I find it funny that the ‘it’ vegetable in the states is making such a slow appearance over here. If I find it at the market on Tuesday I’m going to try this as a test run! Sounds absolutely amazing. Talley it is SO good. I really think you will love it. And I think the possibilities for it are endless, though it’s hard to not just gobble up straight from the pan. Can’t wait to hear about your feast! I love Kale. Have blanche and sauteed it in garlic in the past but never long and slow. I’m thinking of making it for a side dish for thanksgiving-instead of adding it to stuffing. How many could this realistically serve-if I don’t eat it all??Four? Judy — I’m thinking the same thing actually. There will be only three adults at my Thanksgiving, and I’m thinking if I buy 1.5 lbs of kale that will be sufficient and I think that would probably be sufficient for four as well given all of the other food that will be on the table. If you buy two pounds of kale, you will definitely be safe. One thing I noticed was that the Tuscan kale seemed to cook down more than the curly kale, but this also could have been caused by me overcrowding the pan with the curly kale. If you do end up doing two pounds of kale (weighed before you remove the stem) just make sure that you only add enough to the sauté pan so that it covers a single layer — it can be a generous layer, but just not piled high. I hope that makes sense. And as I noted, too, the Tuscan kale, if you can find it, was tastier than the curly. Happy Thanksgiving! Oh one other thing: if you’re looking to do things ahead of time, the kale can be blanched a day or two in advance. If you dry it and chop it and store it in a ziplock bag, on Thanksgiving morning, all you would have to do is sauté it, which could also be done ahead of time and then heated in the same pan just to warm it up right before serving. I love anything that Suzanne Goin does. Her cookbook Sunday Suppers at Lucques is one of my favorites. I’ve been thinking about planting kale and now you’ve inspired me to do it! I just made kale pesto, also blanching the leaves before proceeding with the recipe, and I can tell this slow cooked version would disappear from my pan too! love kale, will be trying this for sure! 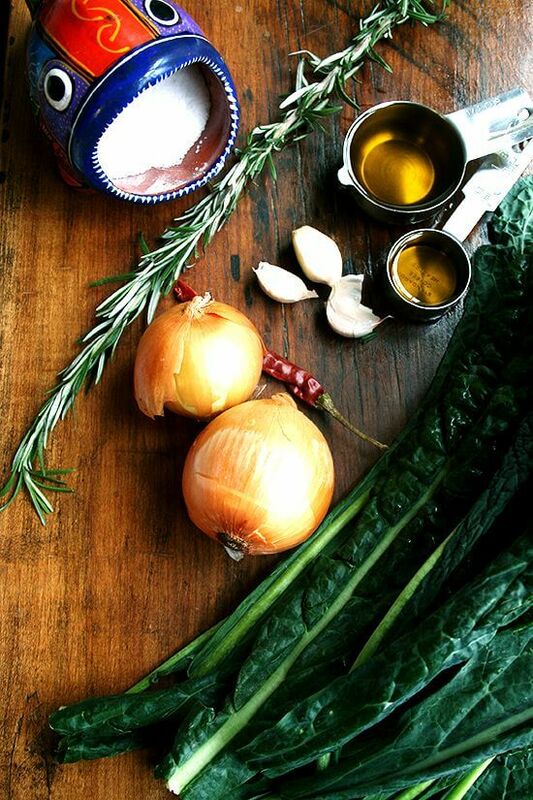 SallyBR — I have been making mustard green pesto, but I am dying to try kale pesto. Happy Thanksgiving! Jon — I will check immediately. How have I overlooked this? Jon — just found the kale chapter. I want to make each of those recipes. 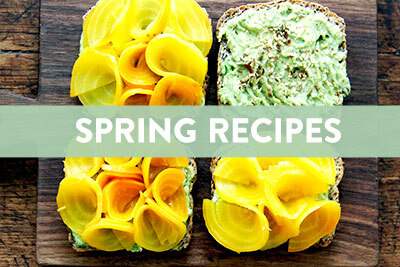 The additions of grilled bread and an egg sound so fabulous. Thank you for directing my attention there. I never paid much attention to the soup chapter in that book, and after just flipping through it, it seems there are other chapters I have overlooked as well. That book is such a treasure. Delicious looking kale! However, I have an unrelated question, but can you answer? Recently I made a pie shell for a quiche. I blind baked it for five minutes, and the whole thing shrank. I made a second crust with the edge hanging over the edge of the pie plate so it would not shrink. This one did not shrink but turned into stalactites. I always use an all-butter pastry and with a double crust pie it is delicious. I suppose I could use some vegetable shortening, but I think that it a little gross. But maybe you have a brand to recommend without additives? If I were to bake the crust blind with pie beads or beans, wouldn’t the crust still shrink at the top? By the way, how far up the empty crust should the beans go? Finally, if you add beans, doesn’t that defeat the whole point of baking the crust for five minutes? ie Making the crust less soggy and doughy. Any suggestions? No rush on these questions but when you have a chance. Thank you. Liz — I think you should give blind baking another shot. I do this when I bake the Tartine quiche, which I think is the best quiche ever. Their recipe calls for baking the shell lined with parchment paper and filled with dried beans or pie beads for about 25 minutes. 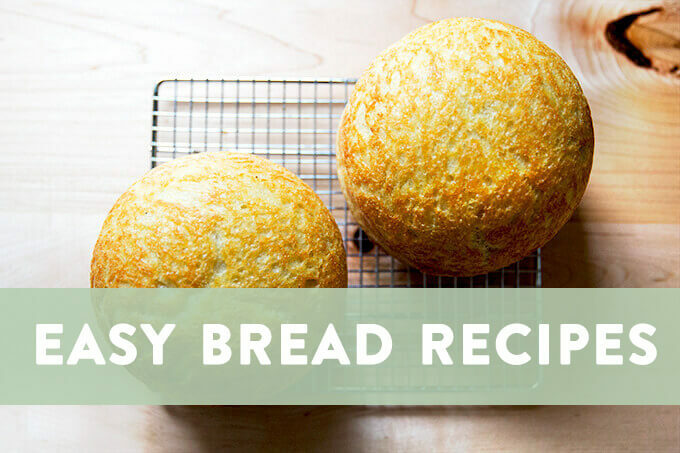 This will keep the crust from shrinking down. Then you remove the pie beads and bake it without anything in the center for another five minutes, which helps prevent the bottom from being soggy. I have photos on my quiche post: https://alexandracooks.com/2009/08/17/quiche-perfected-homemade-creme-fraiche-a-little-trip-to-tartine-bouchon-napa/ that might be helpful. 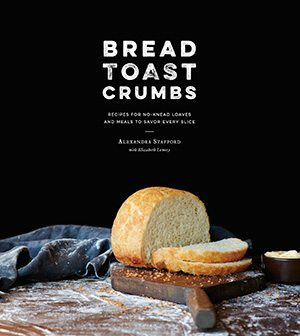 If you are still looking for a custard recipe, too, try the Tartine recipe, which calls for whole milk and creme fraiche. It is SO delicious. 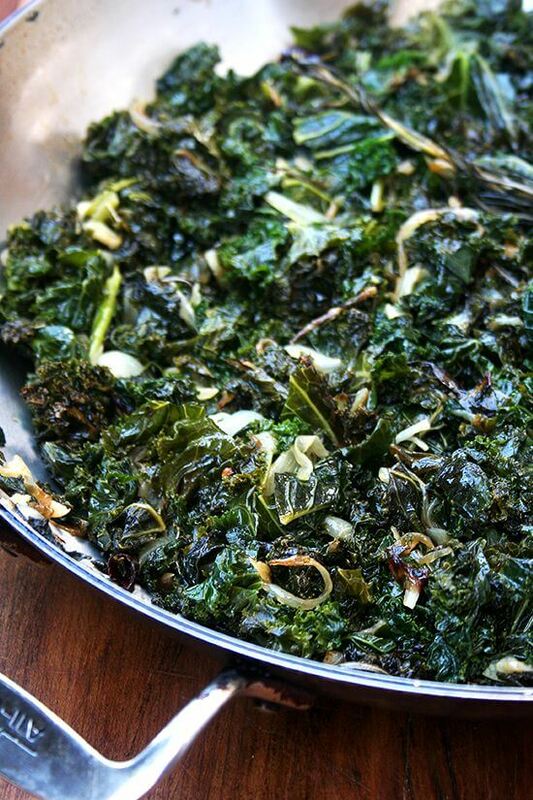 The only thing that gives me pause – I also really love just sauteing Kale “very quickly over high heat with a little olive oil, garlic and crushed red pepper flakes” as you say, and beside it being delicious one of the things I like is that none of the nutrients from the Kale are lost. But to blanch these leafy beauties for 2 min? Are we washing away a ton of the kale goodness when we drain that water? Arrg – why does that prospect discourage me, so? Peter — I share your suspicions. The blanching and then the 30-minute cooking time does worry me as far as nutrient loss goes. I honestly don’t know the answer to this. I just googled does “blanching kill nutrients,” and of course the answers are varied. 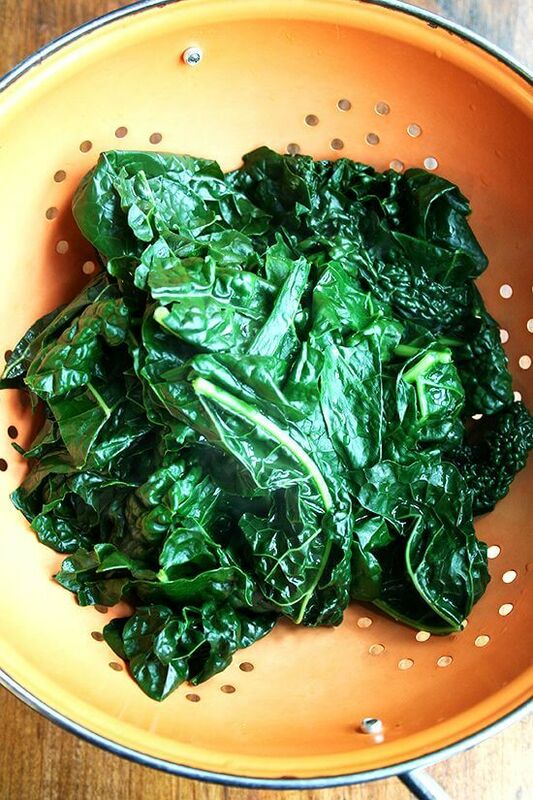 This article offered some good information: https://www.livestrong.com/article/528167-nutrients-in-vegetables-after-blanching/ and this one specifically for kale seems to suggest that the long cooking time will deplete it of nutrients: https://www.livestrong.com/article/544243-does-blanching-kale-reduce-its-nutrition/ Bummer. Well, at least we like kale in other ways 🙂 Have a wonderful Thanksgiving! Will there be a turkey? And a tofurkey? This will not serve as a side dish at Thanksgiving bc i’ts a meal. I buy chopped kale and then put it in the foodprocessor to “mince” it. This might seem weird but this is the way we eat it in the Netherlands, translated it’s called “Kale mash”. Boil potatoes about 10 minutes, add the kale and boil untill the potatoes are done. Mash it with hot milk and butter. In the meanwhile crisp up salted pork (not bacon!! ), mix it in with the mash and a little of the remaining pork fat. 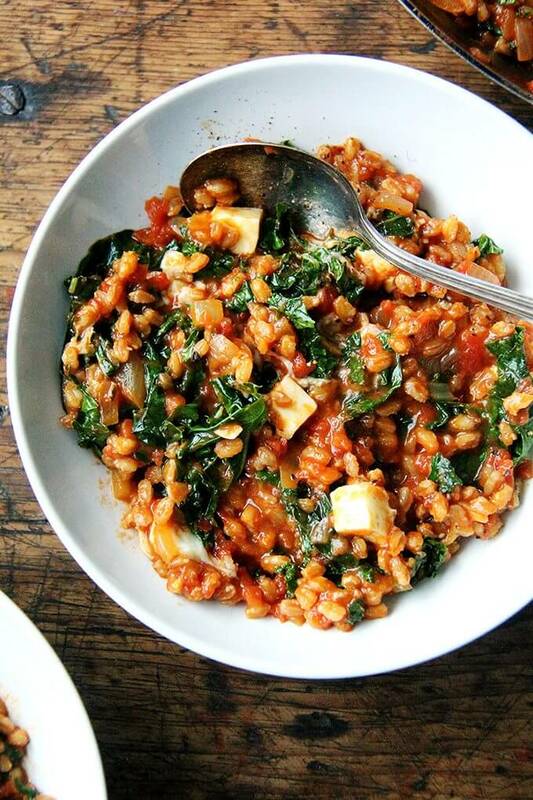 Yes it’s a farmers dish, but if you like kale and you want to make the most of it, give it a try sometime! Happy Thanksgiving and thanks for sharing your recipes! Dorothea — this sounds amazing! Seriously. I made a dish in this vein this evening from the Zuni Cafe cookbook per Jon’s suggestion. About how much kale per potatoes do you use? I have everything to make this except the salt pork, but I need to do a grocery run tomorrow anyway. Seriously, I would gobble this up. Thank you for sharing! Happy Thanksgiving to you as well! Made this last night and it was SO good. Seriously, wow. I loved what the rosemary and chili de arbol did together. 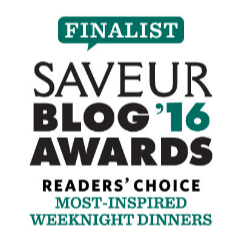 I will have to take a look at the kale recipes in Zuni too–thanks to Jon above. It’s definitely kale season! Lucy T — So glad you like this! I know, isn’t it addictive? It’s unfortunate that it doesn’t yield that much. I’ve made yet another batch, however, and now that I’m familiar with the process, it doesn’t feel like as much of an effort. I am dying to try the Zuni recipes, too. coming up and have to take a dish, so this is def. in the top 5! Thank you, Dorothea! Just knowing that the mash turns out green is really helpful. This sounds like a wonderful post holiday-I-don’t-feel-like-cooking dish, so I will definitely report back when I make it! 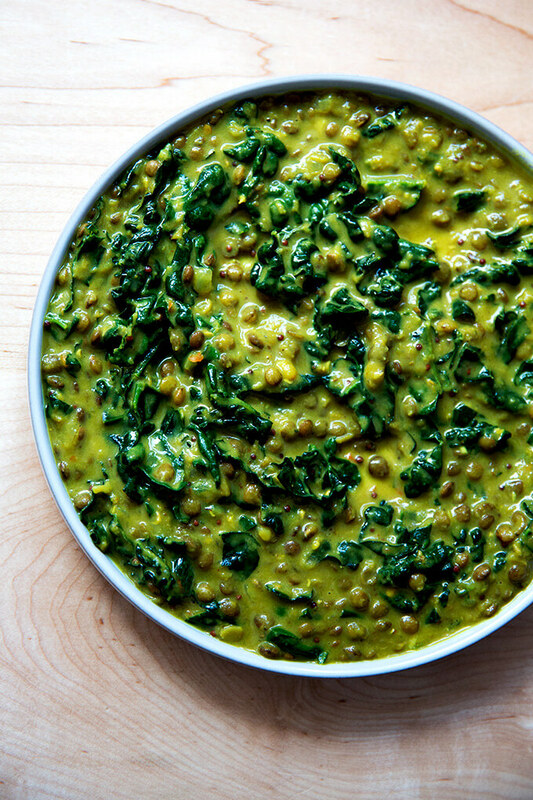 Hmm, I made this with kale last week and it was amazing. I’m making it with broccoli raab right now because that is what I got in my CSA this week. I hope it turns out just as good! Meghan — Yum! So happy to hear this. If you feel like it, report back on the broccoli raab — I’ve been wanting to try the same recipe with mustard greens because we get boatloads of them all winter long in our CSA. I could eat that kale all day long. It turned out really good, although it didn’t get as crispy as the kale did. I think it would work with mustard greens too – I also get boatloads of them, so I will probably try that as well. If I was buying something specifically for this recipe, I would go with kale, but I think it works with some other greens if you have them. Meghan, thanks so much for reporting back. I wondered about the crispness as well, but if the taste is good, I can live without the crispies. Happy holidays! Yum. I had this with cheesy polenta. Perfect match. That sounds like the perfect match. Must try that soon! We made this tonight and thought delicious. We too couldn’t wait the full 30 minutes and had after about 15 minutes. Was lovely and wilted and yummy. We will try again with full 30 mins another day. We didn’t drizzle any olive oil on top and it was scrumptious. Thanks!